another year has passed and yes the class is alive and growing. 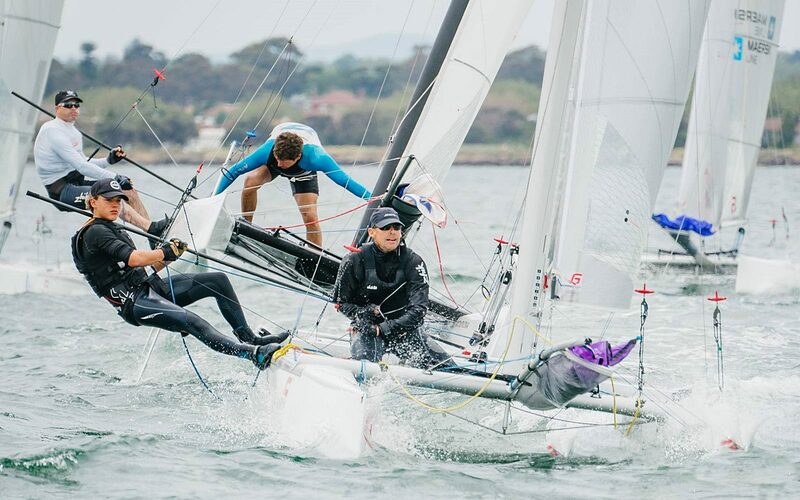 Not an easy task to perform as competition within the sailing world is still growing and everybody wants to pick up the kids leaving the Optimists. In 2016 we have seen quite a lot of new boats on the market. And while most builders still dream the one design dream where solid monopolies secure solid earnings, the F16 class this year presented seven different brands and numerous suppliers to choose from. With activities in Canada and Russia, the F16 community has entered two more countries. 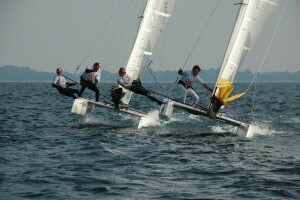 And we are proud to have the Swiss RACES organisation taking care of the F16 sailing in Switzerland. Shaun Connor winning the title. In May the French Nationals were held in the famous spot of Hyères with Emmanuel le Chapelier and Theo Constance managing best. Germany and the Netherlands followed in September with Katrin Santiago and Thomas Koenig finishing first at the German Nationals. 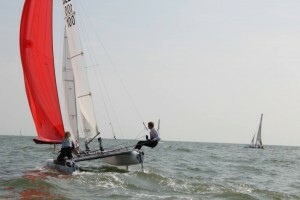 With Henri Demesmaeker and Isaureen Mannaert first the Dutch title went to a team from Belgium. Those two grabbed the National title in Belgium as well. Andi and Andrea Lutz won the Swiss Nationals. 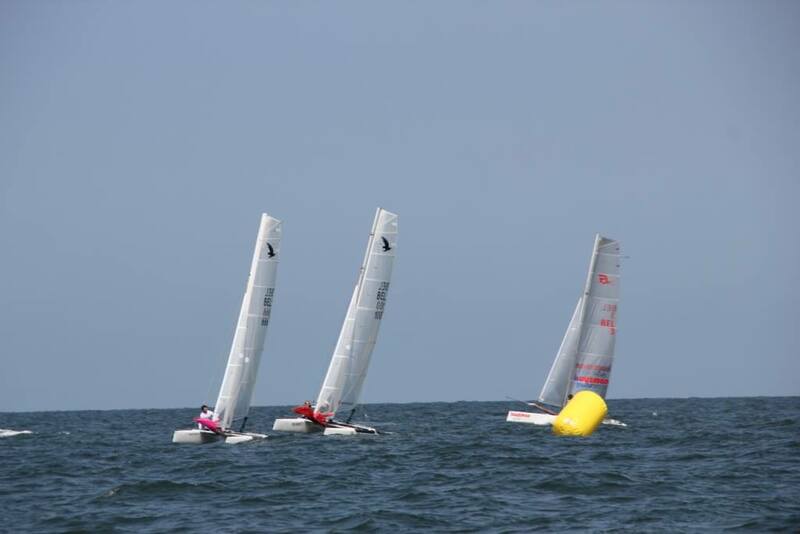 The famous resort of Knokke saw the 2016 F16 Worlds. One of the biggest European catamran sailing clubs, the RSBC organized an event, that again provided warm sun and fun in Northern Europe. With more 45 boats from eight countries registered, it was the biggest F16 event ever. . And again the F16 fleet covered sailors from eleven years up to the age of 63. Exept for the Hobie 16 no other catamaran class has managed that so far. 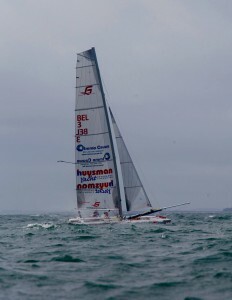 Australia sent three teams managing the challenging conditions with big winds, waves and currents very spectacular But knowing the venue best, it was Henri Demesmaeker with Alec Bague outclassing everybody else in the fleet. Thank’s again to Jasper van Staveren for the awesome series of photographs about this event. Next to racing, the class updated the class rules within the regular five year period. 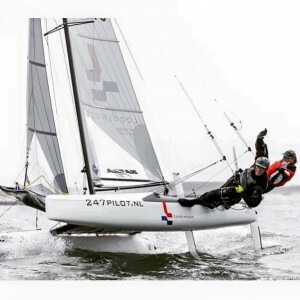 The must have in 2016 was foiling. Big monohulls and small dinghis, the AC and Extreme Series, the British Whisper, the Flying Phantom and the S9: floating seems to be out of fashion. But a closer look draws a different picture: those boats are expensive, they ask for additional skills from helm and crew and they rquire stable winds in order to fly. And apart from the Moths racing in uniform fleets is still the big exeption. The Class Officers are watching those developments very closely. But at present, we believe that foiling at this stage of develpoment does comply with our core values. And these still are: having fun on the water, taking friends, the beloved or the kids along and boats that are safe, affordable and easy-to-sail. 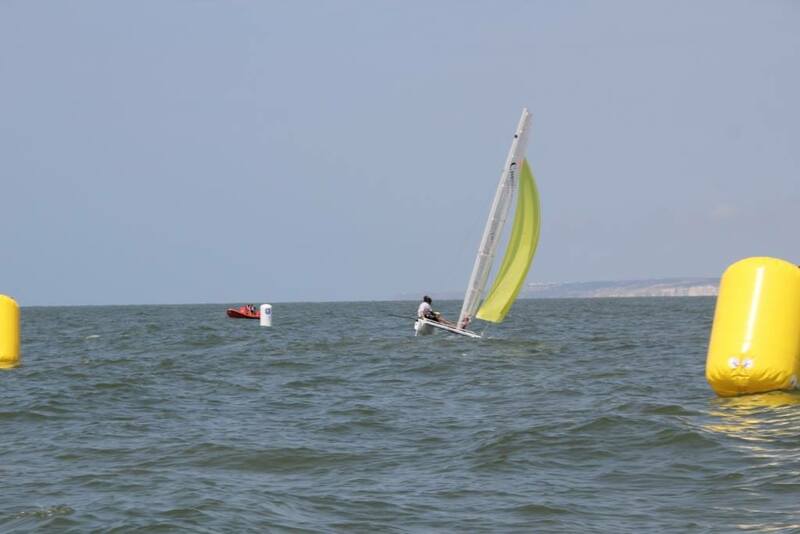 At the WGM in Knokke, foiling of course was an issue. If the builders can agree on a reasonably framework, we plan to launch a new class called F16-f, sharing the racecourse with the floating boats. But for the reasons mentioned above foiling was not on our agenda when changing the class rules in 2016. We are still awaiting WS approval, but the main changes were lifting the minimum weigth and limiting sail head and daggerboard length. 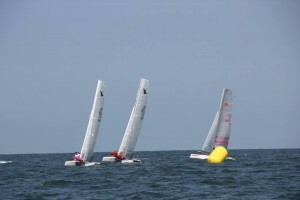 Now the minimum weight for singlehanded sailing will be 119kg, the minimum sloop weight will be 123kg. Next to that, we changed a couple of minor issues in order to improve the measurement process and we skipped some rules not beeing necessary any more. All changes proposed serve our core value of making things as easy as possible whilst preventing soaring production costs. Besides discussing the changes of class rules, the election of the executive commitee was on the WGM Agenda as well. All officers were reelected and the management team will be serving the class at least another year. As our constitition requires a ballot for changing the class rules we filed the proposals after the WGM and then asked the National officers to circle the ballot. Exept for minor topics the changes proposed were accepted by a 2/3 majority of the sailors having voted. As soon as we have WS clearance, the new rules will be published in detail. In 2017 Switzerland for the first time will host a European Championship in Morges at the shores of Lake Geneva. Next to that F16 sailors will be able to attend lots of events in Europe, the U.S.A. and Australia. We will offer clinics, Championships, fun events and long distance races. 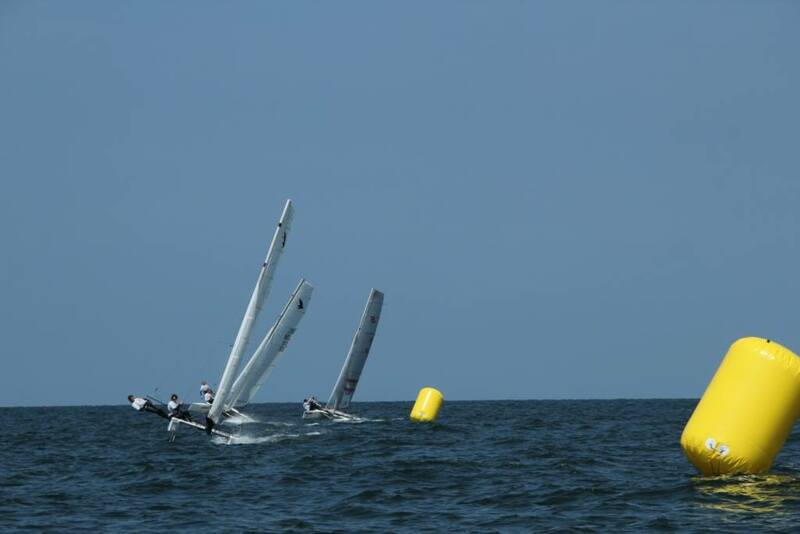 As the boats have similar performance the German F16 Class and the German F18 Class will continue their close cooperation. We will watch the technical develpoments and it looks as if we will see a couple of foiling 16 foot catamarans in 2017. One of the most important projects for the Class Associaton will be preparing the 2018 Worlds in Melbourne. As this event will be held in January, boats from overseas should be shipped in October at the latest. 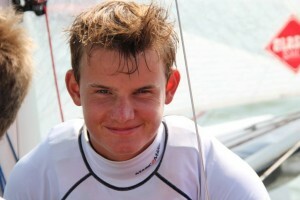 Therefore the Class is working on „boarding events“ to finish the sailing season and have the container on site. Have fun in 2017 and stay tuned on www.formula16.net and fb. Royal Brighton Yacht Club, in conjunction with Elwood Sailing Club and the Australian F16 Class, will host the Formula 16 World Championships in January 2018. The F16 classes are very active in Australia and there are strong fleets in Europe and around the globe. 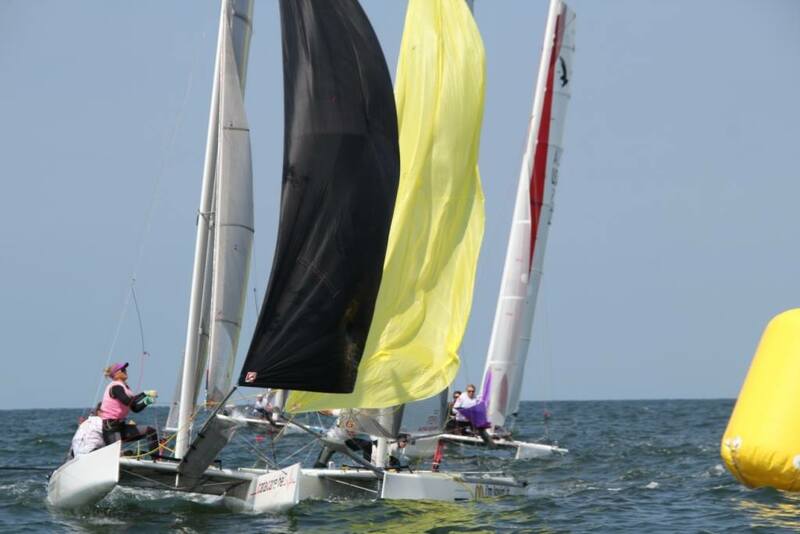 It is expected that the 2018 Worlds fleet will comprise approximately 65 entries including Viper, Taipan 4.9, Mosquito and other classes. 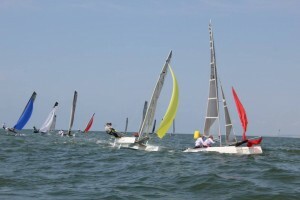 RBYC was selected to host venue for this important event for a variety of reasons. Brighton’s depth of experience with event and race management is further strengthened by partnering with their neighbouring catamaran club at Elwood. “We are very excited to see the F16 Worlds held in Australia”, said F16 Australian President Simon Dubbin. “There has already been strong interest from F16 sailors overseas and Melbourne is a great place to host the championship. Conditions in the racing area are typically perfect for the F16 and RBYC will be a great venue”, he said. There is ample boat storage and a modern clubhouse with outstanding social facilities at Brighton. Substantial renovations are now underway, designed to make RBYC the perfect venue for major “off the beach” championship regattas. Within a few minutes of the beach and marina, the sailing waters of Port Phillip are up there with the very best in the world. January has regular southerly sea breezes, with most days seeing light winds in the morning building to moderate to fresh in the afternoon. The race areas are clear of commercial shipping and there is minimal tide. The club is located 12km from the Melbourne CBD and 5km from St Kilda where there are a wide variety of accommodation types available. Melbourne is one of the world’s most vibrant cities right and known as the Major Events Capital of Australia, hosting a range of sporting and cultural events. There is plenty to do and see in and around Melbourne, and wineries, Mornington and Bellarine Peninsulas and Phillip Island are all within a day tour. The International Airport is just 36km away. Middle Brighton Station is a 1.5km walk. The F16 class will be present on the Paris boatshow from 5 till 13th of December! Come and visit us! 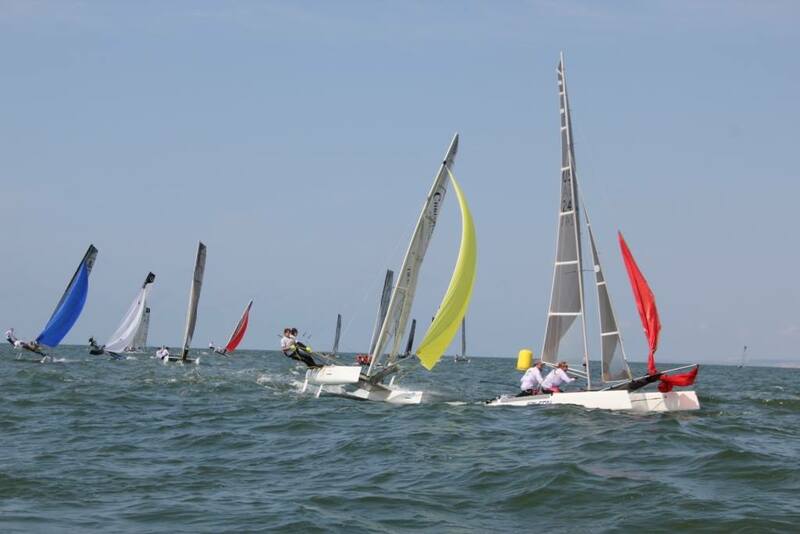 20th to 24th of July the 2015 F16 Europeans are hosted by Circolo nautico Cesinatico in Italy and the event promises to be best ever organised in Europe. Today already 39 boats are registered and there are only 2 days left to pay the lower entry fee. More than half of the fleet are mixed teams and 4 solo sailors show once again the versatility of the F16. – Sanne Wielenga/Thomas De Jong – Nacra F16: These youths placed 10th overall at Round Texel this year and will be the Dutch team to watch. 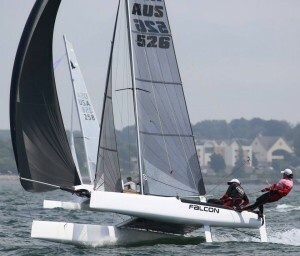 – Adrian Fawcett/Jesse Dobie – Falcon F16: These Aussies took the F16 world champion title last year in Newport and will be eager to defend their title this year! – Emmanuel Le Chapelier/Eric Le Bouedec – Bimare F16: Having won Eurocat multiple times, and the Viper worlds these guys have been on fire for a while. – Aurélie Van Schoote/Morgan Good – Falcon F16: These youths took the vice-world champion title in 2013 in Germany and the French F16 title. Morgan is currently campaigning on the Nacra 17 but will team up with Aurélie again for this event. – Henri Demesmaeker/Alec Bagué – Viper F16: Also from Belgium this team has won the last edition of Eurocat. In 2013 Henri became F16 world champion and in the 2014 Europeans took 2nd. Young but a lot of experience already they will be going for gold. 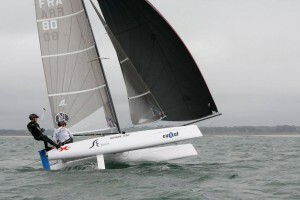 In total 6 F16 brands will be represented: AquaRaptor, Bimare, Falcon, Goodall, Nacra and the new Mattia. If you have registered for the Europeans, please remember to bring along your certificate of coverage from your liability insurance and your measurement certificate. Ask your insurance agent for a paper in Italian. Some companies will provide this. “Size does not matter” – but hardly anyone knows it. To change this and to strengthen our class, the International Formula 16 Class Association will take a stand on the multihull forum Boot Dusseldorf. Here we will present the sailing world our offer: a fast, safe and easy boat, single-handed, double-handed, families and youth fit, while one of the fastest sailboats are available on the market today. Gill de Bryne will provide a Falcon F16 and the association and some members are available to supervise the booth. But we get the booth not free. The Fair Dusseldorf calculated 2.000, – EUR, we currently do not have the cash. Therefore we ask you and every other supporters of our sport to make a donation so that our trade fair can be financed. Any amount is welcome, you will receive a receipt for tax purposes and will officially as Formula 16 supporters listed on our site. That is, if you wish. For donations simply click the “Donate” button here and follow the instructions. Please as a keyword. Enter “boot2015”. The first 700 € are incidentally already done.